The library functionality was introduced within Windows 7 and provides users a single point of entry for specific data. For example, a company can have their data stored on several servers and for users it is not always clear what data can be found at which location. In such cases, the library can offer the users a great way to easily access the locations where the data is stored, with a single point of entry.Since it is not desired that the users will have to configure this themselves, I have written this post so that you can easily create your own company wide custom libraries. Log on the Windows 7 VM with credentials which has access to the locations you wish to add to the libraries. In the right pane, right-click on a white part of the screen. Fill in the name for the Library. Right click on the library and select Properties. Add the locations you desire to add to this library. Select the location you desire to set as the default location to save data to and click on “Set save location” to configure this. Select what you want to optimize this library for. 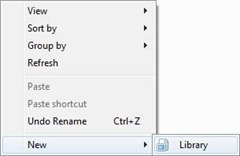 Edit the file of your library with Notepad. Here you can specify a file with the icon you desire to represent this library. 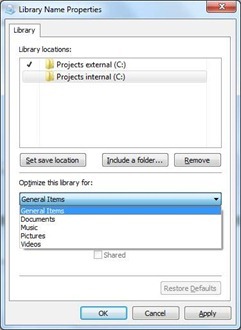 Copy the file from the library you have just created to a location accessible from the network. 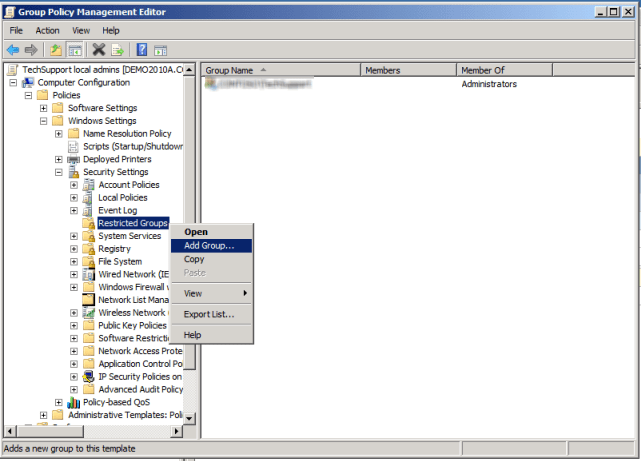 Edit a user Group Policy. 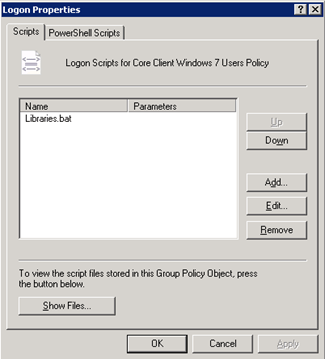 Goto User Configuration -> Policies -> Windows Settings -> Scripts (Logon/Logoff) -> Logon. Have you found yourself searching for the right place whenever your in a stituation where you need a specific Windows setting, an Office behavior or a third party application – and you want to control that with Group Policy? How do you know if there’s a GPO for what you need and where it’s located? Well, there are a couple of steps you can use. Your first step probably is to check if there’s a ready-to-go GPO you can deploy. For that, you can fire up GPMC and check there. But other than browsing through the GPEditor tree or using the GPMC search, there are other two additional options. Those are good when you are with a customer and can’t get your hands on a machine with GPMC loaded. The first option is one of the coolest Azure apps I’ve seen: http://gps.cloudapp.net. GPS stands for Group Policy Search – you can search for GPOs by name or browse the GPO tree “virtually”. You can get it from any machine with internet access. If you’re more the download-n-go kind of guy, someone who sticks with references, there’s a GPO reference Excel spreadsheet: http://www.microsoft.com/downloads/en/details.aspx?FamilyID=18c90c80-8b0a-4906-a4f5-ff24cc2030fb&displaylang=en. They contain the setting names, the registry location the settings change, the path to browse and the “supported on” information. All searchable – and filterable, excel-like. That should get you going. By now, you should know if there’s a built-in GPO you can use. In case you found what you were searched, consider yourself done with this article. If not, read on. So no luck with the built-in stuff. Good thing there’s the community and fine places you can find and download ADM(X) templates from. ADM(X) templates are simply templates you can add to Group Policy Editor – based on the information in the template, the correct registry settings are forced on the client. Reading this, you probably noticed that this only works for registry settings, so it’ll only add “Administrative Templates” settings. There are ADM template files for pre-Vista GPMC administrators and ADMX template files for Vista+ GPMC administrators. Vista+ GPMC understands ADM, too, but XP’s GPMC only eats ADM template files. So be sure to search and find for the correct format. For Microsoft Office, there are downloadable ADM(X) template files around: http://www.microsoft.com/downloads/en/details.aspx?displaylang=en&FamilyID=92d8519a-e143-4aee-8f7a-e4bbaeba13e7 and http://www.microsoft.com/downloads/en/details.aspx?FamilyID=64b837b6-0aa0-4c07-bc34-bec3990a7956&displaylang=en. No biggie to find them. ADM templates can be imported in GP Editor by clicking the “Administrative Templates” node and choosing “Add/Remove template”. For ADMX, you’ll have to either copy the files to the CentralStore or to the local PolicyDefinitions folder and re-open the GPEditor. It appears that I have created a link list for ADM template files in the past: http://www.frickelsoft.net/blog/?p=38, you may find other ADM template using Bing or Google or any other search engine. If you’re familiar with German, at least a bit, you can check Mark Heitbrink’s Group Policy site in German. He has a ton of ADM template files you can download and adjust: http://www.gruppenrichtlinien.de/index.html?/adm/Beispiele.htm. #24 for Adobe Reader is a real pearl :-) Also, I’ve found http://www.appdeploy.com has some good tips for you. They not only have tips and tricks about zero-touch installations, unattended installer packages and script installations, I’ve seen a couple of good ADM templates there. Worth a try! Still not lucky? Okay, time to get our hands dirty. When you change a setting, close the application and re-open it, the setting needs to get stored somewhere. Pretty likely that’s some place in the registry or some ugly .ini file. You only need to find where. There are tools that help you with that. Regshot is one of these great tools for free. You create a “before” snapshot of the registry, then open your app, change the setting, close it and make a “after” snapshot. You then compare the two and find the changes the software setting obviously had to make: http://sourceforge.net/projects/regshot/. There are other tools out there. Process Monitor (formerly FileMon and Regmon) is a great tool that helps you trace file and registry operations and filter for applications: http://technet.microsoft.com/en-us/sysinternals/bb795533. (3) Use GP Preferences Registry settings to deploy the changes all at once! Clearly, option 3 is the way to go. Creating custom ADM templates is… well, not too easy. Scripting is … yeah, so 1990. How to use Restricted Groups? 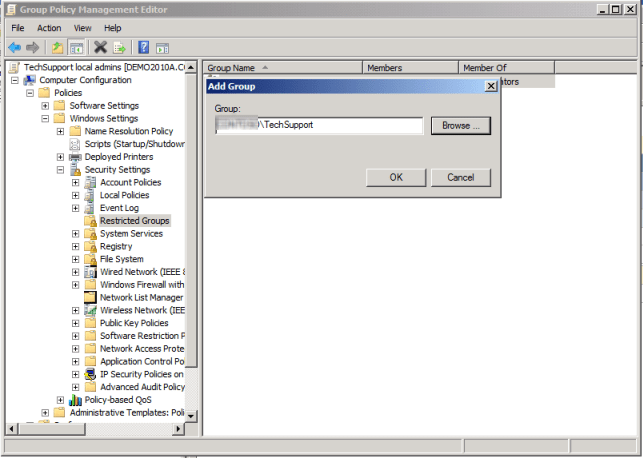 This article describes the feature “Restricted Groups” in Group Policy. This feature enables you – as the administrator – to configure group memberships on the client computers or member servers. You can add user accounts to groups on client machines that are in the scope of the policy. As there are many questions about this in the newsgroups, I will come up with an example that shows how to put a group of Active Directory users into the local Administrators group on the clients. For this article, I assume that you already created a global security group containing all users that shall become local Administrators on some client computers. 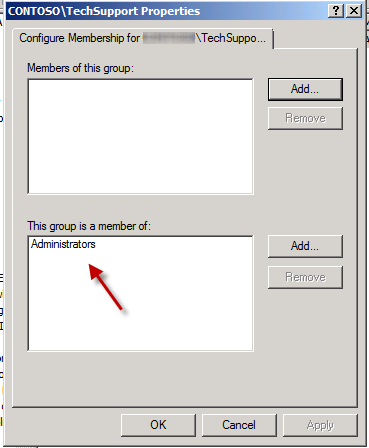 In my example, the group is called “localAdmins”. The target (= client) computers reside in a specific OU. Computer ConfigurationWindows SettingsSecurity Settings and then right-click “Restricted Groups” and choose “Add Group”. You simply add the created group by clicking You simply add the created group by clicking “Browse..” or typing the group name into the box. After clicking “OK”, another window opens up, where you can find two boxes. The upper box, saying “Members of this group”, the lower one saying “This group is a member of”. In my case above I am adding a group called TechSupport. If you added users or groups into the “Members of this group” box, you would advise the Restricted Groups feature to put the users and groups you selected into the localAdmins group. Restricted Groups would then replace the current members of the localAdmins group with the users and groups you filled into the box. Please understand that it replace them by wipeing existing users out of the local Admins group. Since we do not want to add users or other groups to our existing group, but instead want to add a new group to the local Administrators group on all of our clients, we have a look at the lower box – labeled “This group is member of”. We click “Add” and type in the name of the group that we want added to the localAdmins on each client. In this case, it’s “Administrators”. We then simply click “OK” and “Apply” and close all windows. “This group is member of” advices “Restricted Groups” to add our localAdmins group into the “Administrators” group of the clients. The existing group members will not be touched – it simply adds in this case the TechSupport group to every clients local administrators group.